For three days only the sporty Spanish outfit is making available selected, pre-owned Exeo saloon 2.0 TDI SE models from just £15,250 with two years' free servicing and low rate finance. Meanwhile, selected used Ibiza 1.4 SE and Sport models will be offered with a great, low rate finance deal of just 4.9% APR - subject to status, conditions apply. The campaign is being run at participating dealerships nationwide and means buyers in search of nearly new bargains need look no further than their nearest SEAT garage. Of course even without the great finance and free servicing offers, the exceptional value presented by the SEATs is clear. 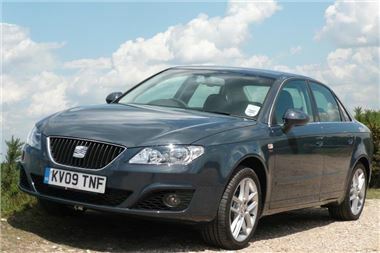 The upper medium segment Exeo 2.0 TDI SE 143 PS, for example, comes packed with standard-fit kit. Among the hi-tech goodies to be found in the car are: Bluetooth mobile phone connectivity, dual zone climate control, alloy wheels, one-touch electric windows all round; height and reach adjustable multi-function steering wheel; AM/FM radio/CD player; Aux-in connection; USB port; ABS; ESP + EBA; six airbags with front seat passenger airbag deactivation; remote central locking with deadlocks; volumetric alarm with back-up horn and tilt sensor and electronic engine immobiliser. Likewise, the Ibiza 5dr 1.4 Sport is both generously specified and well built. Standard equipment includes 16" alloys; sports suspension and sports seats; leather steering wheel and gearknob; air conditioning; electric windows all round; six-speaker radio/CD player with steering column-mounted controls; ABS; speed-sensitive power assisted steering; rev counter; driver, front passenger and front head/thorax side airbags (with passenger-airbag deactivation switch); remote central locking and height adjustable driver and passenger seats. Explaining the thinking behind the event, SEAT UK Used Car Manager David Ardern said: ‘The appeal of all Approved Used SEAT models is clear, but with the addition of these limited-time finance and servicing offers on selected models I believe we're making the cars pretty much irresistible!